Pseudo-gestalt! I like the concept and the term… do you have more contemporary comics examples? Wow, that’s a complicated one. The background setting looks like gestalt, except the position of the boy in the background doesn’t make sense–so either the boy is wrong or the edge of the water is wrong. The male figure seems to move left to right with the panels, while the female figure is moved to what would be an earlier position, so she’s actually in two locations at the same time within the second panel, which would be embedded closure. Alternatively, her leg and hip are really only part of the first image, and so they are breaking frame while also being divided by the gutter. 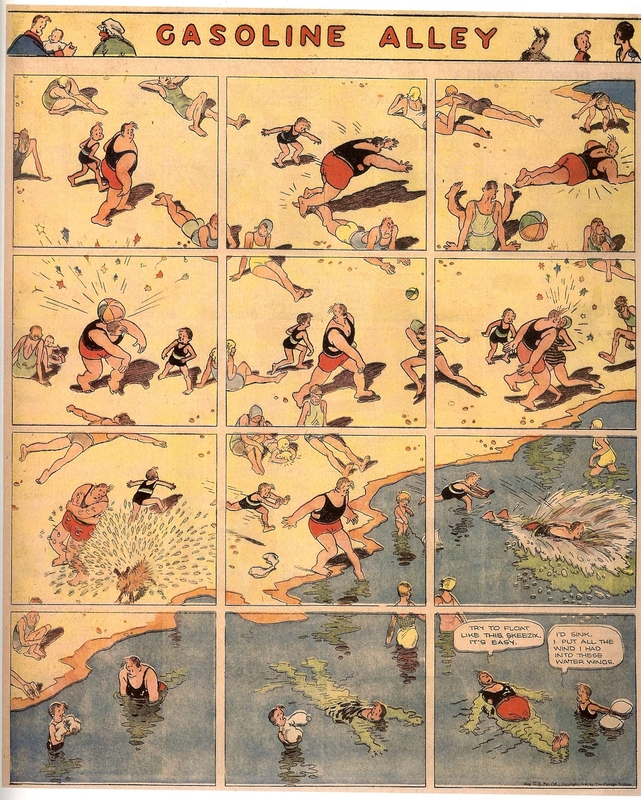 Here’s the full King comic: https://theperiodicfable.files.wordpress.com/2011/10/gasoline-alley-1.jpg in some ways it breaks all kinds of rules… but it also works beautifully! Oh, that’s even more complicated. He’s creating a full-page gestalt effect, while cheating with the placement of the main figure who has to travel continuously left to right with the reading path as if in a different plane of existence. That’s brilliant.